Barrett-Jackson will be auctioning Chrysler CEO Sergio Marchionne's customized 2011 Dodge Challenger SRT8 392 on behalf of Chrysler with proceeds going to United Way for Southeastern Michigan. The auction package includes a bonus item from Mopar as well. The Chrysler Group Chairman and CEO offered the car for the Palm Beach, Florida Barrett-Jackson auction on April 4-6th as part of a charity drive for the United Way of Southeastern Michigan (UWSEM). Mopar stepped in to add their own bonus as well. 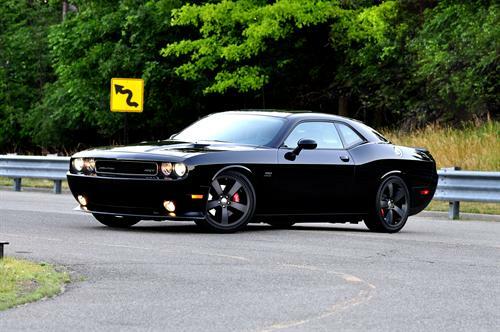 The car is a highly customized 2011 Dodge Challenger SRT8 392 and has been autographed by Marchionne. It contains several one-of-a-kind custom features, such as the Dark Charcoal racing stripes hand laid onto the Pitch Black body paint by the SRT brand design studio. The car has been lowered using Mopar's adjustable coil-over suspension kit, has a Mopar exhaust system, smoked tail lamps, and the 392 HEMI fender badges have been glossed with satin black finishes as have the matte black 20-inch wheels. You can find out more about this amazing custom ride at this link. If that's not good enough, a bonus package to be included with the 2011 Challenger SRT8 392 from Marchionne comes from Mopar. Their latest all-aluminum crate engine, the Gen III 426 HEMI V8, is also included with the auction buy. This is a 540 horsepower, 530 lb-ft monster that is built as a ready-to-install kit for the Challenger. This is the closest most people can come to the urban legend of rockets strapped to road racers. All proceeds from the sale of Marchionne's 2011 Challenger SRT8 392 and the Mopar Gen III will go UWSEM. Marchionne is Campaign Chair for the UWSEM's annual community giving campaign, which began in September and has a goal of raising $35 million in funds for their local United Way organization. The Southeastern Michigan chapter of the United Way recruits people and organizations who bring passion, expertise and resources needed to get charity work done on several fronts, designed to make life better for those in need. The charity is involved in education at the early childhood through high school levels, helping those in need find the services (both public and private) to help the services that they need, and more. The UWSEM also provides services and help to soup kitchens, meals-on-wheels programs, and programs designed to help struggling families meet long-term independence goals. Truly a good cause for the sacrifice Sergio Marchionne is making in selling this awesome car at auction.